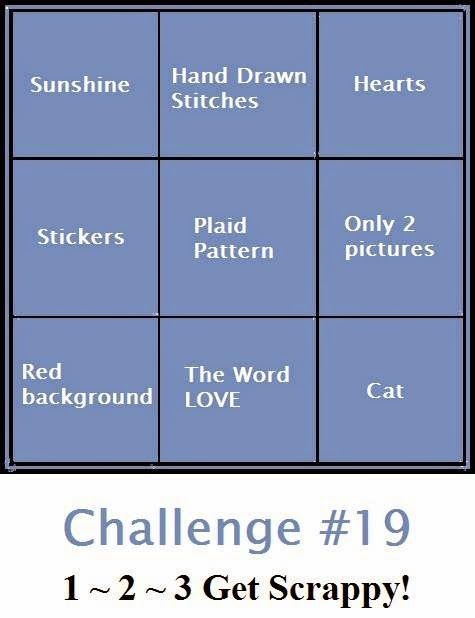 I used the second row across...use of plaid, stickers, and two pictures! Of course, the plaid paper matches the girl's skirts. I had fun using my ticket stickers, some clear word stickers, and that smile sticker, which is fairly new from my stash. Tfl!! Love the bold look of this layout - the bright colors, the large lettering, the straightforward design - it all works so well! Lovely layout!!! Great design!! Thanks for joining us at 1~2~3 Get Scrappy! !